The products of the Doulton businesses were vast, exceptionally diverse, and are widely collected. The major wares are listed below, and in most cases there are specialist publications dealing with each group. In the early 1860s Doulton & Co. began the manufacture of domestic and ornamental salt glazed stoneware that later became known as 'Doulton Ware'. The nearby Lambeth School of Art became associated with the Doulton business from about the same time and Henry Doulton joined the Board of the School in 1863. The decorative stoneware produced in association with the School of Art had enormous success at International Exhibitions in the 1860s and 1870s, culminating in acclaim at the Philadelphia Exhibition in 1886 (and also at Chicago in 1893). Many now famous artists were recruited including George Tinworth, Arthur and Hannah Barlow, and Mark V. Marshall. Popularity of the ware peaked in the late 1890s when about 370 artists were employed at Lambeth, however with the death of Queen Victoria in 1901 and changing social tastes, the demand for the intricately ornamented stoneware declined and by 1914 less than 100 artists were still employed. Following the end of the First World War, Lambeth produced stoneware reflecting more contemporary tastes, but by 1920 artist numbers had declined to only 30. Small quantities of ornamental stoneware continued to be made up to, and throughout (for export only), the Second World War, and in 1952 the artist and potter Agnete Hoy joined Doulton. She combined her unique style with the traditional Lambeth decorating techniques for a last flowering of the Lambeth stoneware tradition. Hoy’s design studio and the Lambeth works closed in 1956. The Lambeth stoneware is exceptionally diverse and highly collectible. Most marks include the words 'Doulton Lambeth' and many pieces are signed or initialled by the artist responsible. There are many specialist texts devoted to the story of Lambeth and its potter-artists. In 1974, Doulton re-introduced 'Lambeth Stoneware' as a casual tableware brand in an oven and freezer proof stoneware body. Other than in name, the modern Lambeth Stoneware has no connection to that produced at the Lambeth factory up to 1956. Doulton’s early success can be attributed to the quality of the modellers, designers and artists attracted to Burslem from the early 1880s. After Shadfort Pinder left the business, Henry Doulton retained the services of the Pinder, Bourne & Co. art director John Slater. Slater was a talented artist and gathered an equally talented team of decorators from the Doulton Lambeth works and from other Staffordshire potteries. Initially constrained by Henry Doulton to working on earthenware, Slater recognised the potential of decorated bone china and travelled to France to study the Sevres and Limoges decorating styles. Some Limoges blank tablewares were decorated at Burslem, but in 1884-85 a bone china factory was built at Nile St. The Burslem porcelains include ornate vases, bowls, plates and tableware. All are of the highest quality and were decorated with landscapes, fruit, flowers, birds, fish and game by a group of talented artists. Doulton displayed his new products at the 1893 Chicago Exhibition to astounding acclaim. Success at the Chicago Exhibition reinforced Slater’s and Doulton’s confidence in the marketability of finely decorated bone china and under Slater the team of modellers, artists and decorators was expanded in the 1890s producing objects rivalling those of the Minton, Derby and Worcester factories. Production of these richly decorated and very attractive items was at its peak between 1890 and 1920, but continued throughout the 1930s. Charles Noke joined Burslem from Worcester in 1889, where he had first trained under Charles Binns and then worked for 16 years. A talented modeller, decorator and ceramic technologist, Noke introduced new glazing and decorating techniques to the Doulton range. Holbein Ware (1895) and Rembrandt Ware (1898) were two of Noke’s first Doulton-Burslem productions, Hyperion Ware and Lactolian Ware, decorated in Art Nouveau style followed in c.1900. Noke’s experimentation with glazes and decorating techniques led to Rouge Flambe (1904), Crystalline Ware (c.1910), Titanium Ware (c.1915), Sung Ware (c.1920) and Chang Ware (c.1925). These Burslem art wares were probably never profitable lines for the factory, but, like the Lambeth stoneware, they build Doulton’s reputation as being at the forefront of the British pottery industry. All are highly collectible and are seldom seen today. Doulton Series Ware was an innovation of the decorator and designer Charles Noke and is simply a series of plates and other items with decoration based on characters from legend, literature, history and song. The poem ‘The Jackdaw of Rheims’ by Thomas Ingoldsby is said to be the original inspiration for Noke to decorate a series of trays, vases and jugs with scenes illustrating the poem. ‘Coaching Days’ is perhaps the most well known Series, but there have been literally hundreds of series, some remaining in production for up to 50 years. Some of the most popular are those based on characters from Shakespeare and Dickens, however, there are also series which depict places, historical events, recreational activities etc. Series Ware is the subject of five books by Louise Irvine. Doulton earthenware and bone china commemorative wares were first produced for the Diamond Jubilee of Queen Victoria in 1887, the Federation of Australian in 1901 and the Coronation of Edward VII in 1902. Commemorative wares have continued to be a mainstay of Doulton production. Charles Noke’s long-standing interest in porcelain figurines began in childhood and was to be amply fulfilled through his work at Nile St. Although initially engaged in the modelling of large vases, Noke began figure modelling in 1894 and over the next few years produced a series of figures in stoneware or parian bodies. These large figures were made in only small numbers. From about 1910 Noke turned to bone china and commissioned some of the best sculptors and modellers to create the figures. The new range of approximately 20 figures was released in 1913 during a Royal visit by Queen Mary to Nile St. HN1, a child figure was named ‘Darling’, supposedly after a complimentary remark by the Queen. Other figures and animal models followed, but public and commercial success was not achieved until favourable reviews were received at the 1920 British Industries Fair – and it was not until 1927 that Doulton committed to their full-scale production. Many other limited edition figurines, often modelled by well known sculptors and ceramic modellers have been produced by Doulton over the years. Doulton animal models in bone china were initiated by Charles Noke between 1900 and 1910. Noke himself was the modeller of the earliest animal models, but many other specialist designers were used by the factory. The models of dogs and horses are perhaps best known, but virtually all domestic and wild animals can be found amongst the Doulton models. In 1969 Doulton acquired John Beswick Ltd and from circa 1979, some Beswick animal models were produced under the Doulton name. In addition to the decorative porcelains, the Burslem factory produced tablewares in both earthenware and bone china bodies. The Doulton tableware combines good design, high quality, and contemporary, yet stylish and elegant, decoration. This is best illustrated in the art deco tablewares of the 1930s. 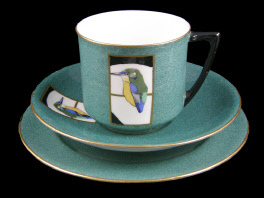 Patterns such as ‘Tango’ , ‘Syren’, ‘Caprice’, Gaylee’ and many others are now regarded as classical examples of the Art Deco style as applied to tableware. In 1960, Royal Doulton introduced a new proprietary body for use in its tableware. The innovation, English Translucent China produced a fine, translucent body equivalent to bone china, but without the use of costly and increasingly hard to find, ground animal bone. The body has been used extensively for tableware and, since about 1979, has been termed ‘Doulton Fine China’. This handpainted ‘Kingfisher’ trio is typical of the sophisticated Doulton (Burslem) tableware of the early years of the 20th century. Doulton ‘portrait jugs’ – Toby Jugs and Character Jugs – were introduced by Charles Noke in about 1933. Noke used the successful precedent set by Series Ware and introduced jugs based on characters from literature and song. ‘John Barleycorn’, modelled by Noke himself, was the first of what has became a popular and successful collectible.